A string is a primitive design object. It places text on the selected layer in a variety of display styles and formats, including popular barcode standards. As well as user-defined text, a special type of string, referred to as a special string, can be used to display board or system information, or the value of user-parameters, on the board. Position the cursor and click or press Enter to place a string. Continue placing further strings, or right-click or press Esc to exit placement mode. Press the Spacebar to rotate the string anti-clockwise or Shift+Spacebar for clockwise rotation. Rotation is in accordance with the value for the Rotation Step, defined on the PCB Editor – General page of the Preferences dialog. Press the X or Y keys to mirror the string along the X-axis or Y-axis respectively. Press the L key to flip the string to the other side of the board. Press the Tab key to access an associated properties dialog, from where properties for the string can be changed on-the-fly. Note that the attributes can be modified during placement, press Tab to bring up the String dialog. Changes made will affect the object being placed, and subsequent objects placed during the same editing session. This method of editing allows you to select a placed string object directly in the workspace and change its location, rotation, orientation or, in the case of inverted strings, size. Click and drag B to rotate the string about point A.
Click anywhere on the string – away from any editing handles – and drag to reposition it. The string will be held by point A and can be rotated (Spacebar/Shift+Spacebar) or mirrored (X or Y keys to mirror along the X-axis or Y-axis respectively). A selected String (inverted, and using an inverted rectangle). Click and drag C to resize the rectangle in the vertical and horizontal directions simultaneously. Click and drag D to resize the rectangle in the vertical and horizontal directions separately. This method of editing uses the String dialog to modify the properties of a string object. As well as using a string object to place user-defined text on the current PCB layer, the string object can also be used to display design, system or user information on the PCB. This is done by placing what is known as a special string, which is a pre-defined string preceeded by the . (dot) character. A list of available special strings is detailed below. A special string is denoted by the string starting with a . (dot) character (e.g. .Layer_Name, .Net_Count, etc). This syntax is also used when referencing a user-parameter, the parameter name is preceeded by the . (dot) character. Examples of design, system and design parameter special strings, shown as source strings on the left, and converted on the right. There is a default set of predefined special strings provided for use with new PCB documents. The designer can also add their own custom special strings, by defining additional parameters at the project-level, these parameters are defined in the Parameters Tab of the Options for Project dialog. To use a special string on a PCB, simply place a string object and select one of the special string names from the drop-down. Accessing special strings for a placed string object. The values of some special strings can only be viewed when the relevant output is generated. Most special strings can be viewed directly on-screen however, by enabling the Convert Special Strings option, on the View Options page of the View Configurations dialog (press the L shortcut to open the dialog). Enabling the Convert Special Strings option allows the data for most of the special strings to be viewed in the workspace, prior to output generation. .Application_BuildNumber – the version of the software that the PCB is currently loaded in. When generating Gerber output, use this string to record the software build that the design was created on. .Arc_Count – the number of arcs on the PCB. .Comment – the comment string for a component (placed on any layer in the library editor as part of the component footprint). .Component_Count – the number of components on the PCB. .ComputerName – the name of the computer on which the software is installed and running. .Designator – the designator string for a component (placed on any layer in the library editor as part of the component footprint). .Fill_Count – the number of fills on the PCB. .Hole_Count – the number of drill holes on the PCB. .Layer_Name – the name of the layer the string is placed on. .Legend – a symbol legend for mechanical drill plots. This string is only valid when placed on the Drill Drawing layer. Note: this is a legacy feature, place a Drill Table object for more detailed drill information. .Net_Count – the total number of different nets on the PCB. .Net_Names_On_Layer – the names of all nets on the specific layer. This string is only valid when placed on an internal plane layer. .Pad_Count – the number of pads on the PCB. .Pattern – the names of the component footprints used on the PCB. .Pcb_File_Name – the path and file name of the PCB document. .Pcb_File_Name_No_Path – the file name of the PCB document. .Plot_File_Name – for generated Gerber output, this string identifies the file name of the Gerber plot file. For printed output, it identifies the layer depicted within the output. For ODB++ output, it identifies the name of the parent folder in which the files are stored. .Poly_Count – the number of polygons on the PCB (consisting of polygon pours, internal planes and split planes). .Print_Date – the date of printing/plotting. .Print_Scale – the printing/plot scale factor. .Print_Time – the time of printing/plotting. .Printout_Name – the name of the printout. .SlotHole_Count – the number of slotted holes on the PCB. .SquareHole_Count – the number of square holes on the PCB. .String_Count – the number of strings on the PCB. .Track_Count – the number of tracks on the PCB. .Via_Count – the number of vias on the PCB. Remember that the full list of special strings available in the String dialog will also include any derived from user-defined project-level parameters. 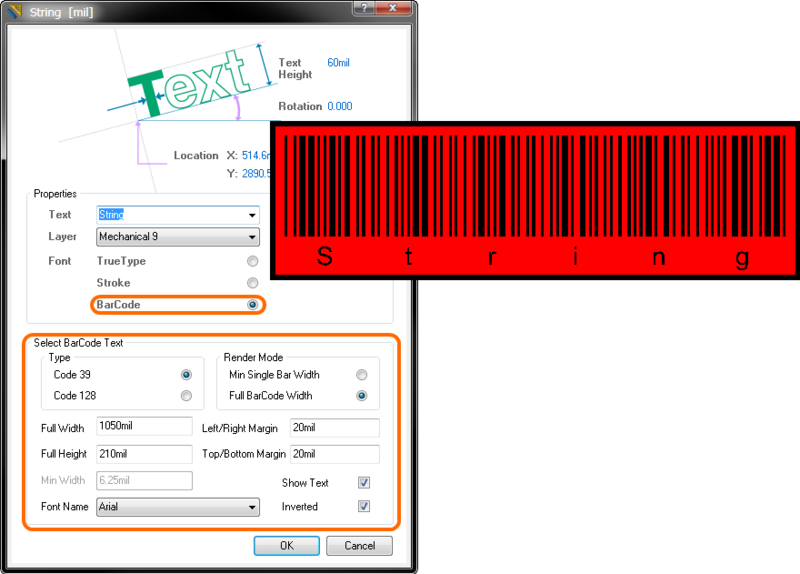 The PCB Editor offers the ability to use Stroke-based or TrueType fonts for string objects. Choice of font is made from within the String dialog. In addition, support is available for presenting text strings in Barcode format. Barcodes are commonly used to tag and identify PCBs, streamlining inventory tracking for example, through use of automated scan-machines. Three Stroke-based fonts are available – Default, Sans Serif and Serif. The Default style is a simple vector font which supports pen plotting and vector photoplotting. The Sans Serif and Serif fonts are more complex and will slow down vector output generation, such as Gerber. To use a Stroke-based font, simply enable the Stroke font option in the String dialog and choose a font type from the drop-down field in the Select Stroke Font region. The appearance of each of the Stroke-based fonts in the workspace. The Stroke-based fonts are built into the software and cannot be changed. All three fonts have the full IBM extended ASCII character set that supports English and other European languages. When using TrueType fonts, TrueType and OpenType (a superset of TrueType) fonts found in the \Windows\Fonts folder will be available for use. The feature also offers full Unicode support. Note that only detected (and uniquely named) root fonts will be available for use. For example, Arial and Arial Black would be available but Arial Bold, Arial Bold Italic, would not. To use a TrueType font, enable the TrueType font option in the String dialog and choose a font type from the drop-down field in the Select TrueType Font region. Use the Bold and/or Italic options to add emphasis to the text as required. The appearance of various example TrueType fonts in the workspace. When using a TrueType font for a string object, additional options are available. Enable the Inverted option to display the text as inverted, with control over the size of the border around the text. An example of inverted TrueType text. The Use Inverted Rectangle option extends the control over the bounding rectangle of the inverted text, including: rectangle size, text justification within the rectangle, and an offset for the text in relation to the rectangle's edge. Fine-tune the appearance of inverted text with control over the bounding rectangle, and the location of the string within it. As a value is entered into the Width and Height fields for the bounding rectangle, pop-up hint text will advise the minimum values that can be entered, based on the actual width and height of the text string itself. Ability is provided to place barcode symbols directly onto any layer of a PCB design, allowing barcodes to be easily imprinted on a PCB as part of the manufacturing process. To use a Barcode font, enable the BarCode font option in the String dialog and define the display options as required in the Select BarCode Text region. BarCode ISO Code 39 (US Dept of Defense standard) and Code 128 (global trade identification standard) are supported, and the actual text string that the barcode is derived from can also be displayed by enabling the Show Text option. When showing text, choose a TrueType font to be used, and set the height for the text accordingly. Example barcode with original (human-readable) text beneath. Specify the height and width of the barcode using either a desired overall width or a minimum barcode element width to control sizing. Whichever method is used, be sure to use sizing that will render the barcode readable to the appropriate scanners! By using a combination of barcode and inverted text strings, along with fills if necessary, a detailed barcode area can be defined on a board, with more information than would otherwise be provided by just the barcode text. 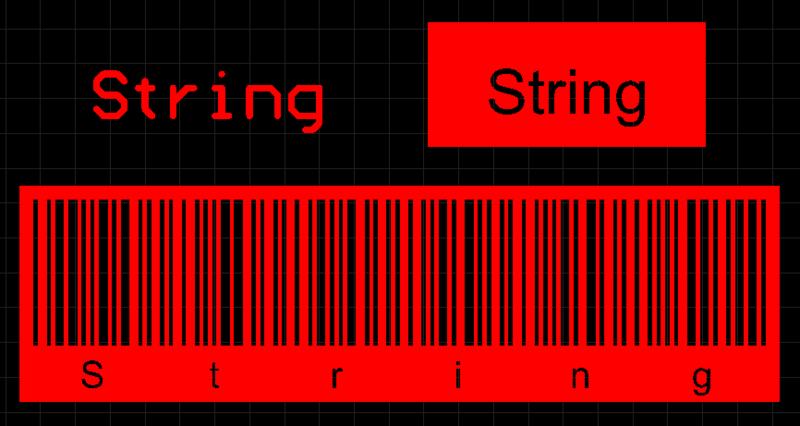 An example of using an inverted barcode and additional inverted text strings.